Among the thoughts brought to light in our discussion was the back-and-forth on the nature of salvation. If you’re like me, you’ve heard from someone, somewhere in your life that once you are saved, for you salvation is a switch constantly switching on and off, and that you’d better hope you’ll die when the switch is on. What kind of salvation is that? Having to pray for every single sin to be forgiven? Even David knew he couldn’t do that (Palm 19:11-13). Having to remember all my sins is relying on myself, not on God, not to mention that having to rely on myself not having a single sin on my current record is relying on myself, not on God. So, say I’m baptized, and the next day I’m driving down the road, and a truck comes toward me, and I have just enough time to cuss before it hits me. Am I going to Hell? Sometimes this is asked sincerely, sometimes with jest. But people wouldn’t ask it if this misunderstanding of walking in the light had been getting around. Remember that John says that the blood of Christ purges us of all our sin if we are walking in the light, not stepping perfectly in the light. Oh, and as a bonus, we experience life with one another, which is important, because salvation isn’t just a thing you get and then wait for. It’s alive and active. And then a simple illustration hit me to explain that grace washes us of sin as we walk in the light. 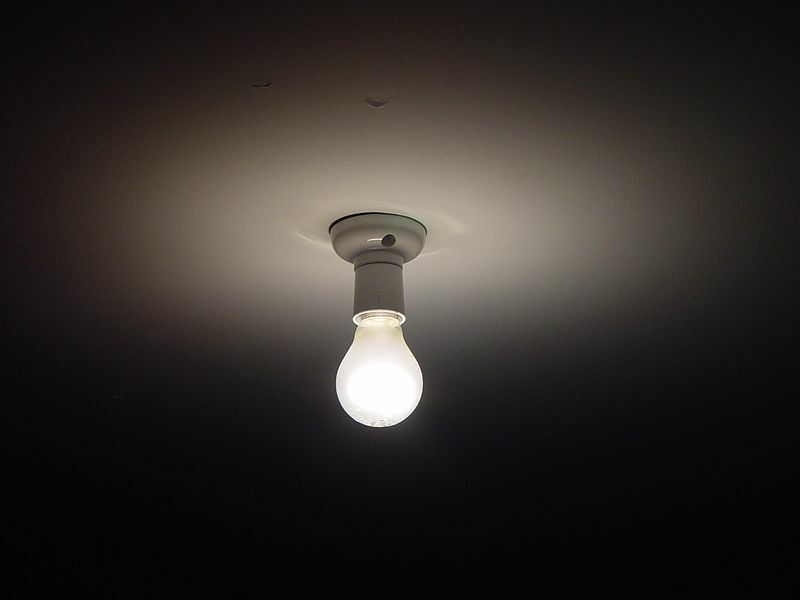 Turn on a single light in a room in the middle of the night. Walk around in that room. You can see what you need to see because you are in the light. Walk outside that light, and you are in darkness. You cannot walk about easily. You are in danger. Close your eyes. You see darkness, but if you are in the light you see a faint hint of light, and if you stare at the light you can see it through closed eyes. Walking in the light means being in the light. It is because of the light (Christ) that you are in the light and can see. Walking outside the light is walking in darkness. It is because you have stepped out of it that you are not in the light. The light neither moved nor went out. You chose to wander off. Now, you may close your eyes while walking in the light, but you are still in the light. This is the stumbling, the moments of giving in to sin while saved. This does not mean it is fine for you to sin, or that you are given an allotment, or that you should test your limits. After all, if you close your eyes, you are effectively blind. And this light is so powerful, after all, that you can see it with your eyes closed if you are in its presence. But the longer you close your eyes, and the more you close your eyes, the more in danger you are of wandering out of light and into darkness. You will sit in the light and think that you are okay because you are in the light. Eventually, being in the light becomes “useless” to you. You might as well be in darkness. Eyes closed, you will wander in to darkness, and if this happens slowly enough, you may not realize you are in darkness. You closed your eyes for a minute, became confident, and forgot that it was the light that you need. But if you do close your eyes, it does not mean you are automatically no longer in the light. It does mean that the light is at this moment lost to your sight, but you are still in its presence. That is grace. It is grace because God knows that sometimes we close our eyes. Grace is not a switch God is cutting off and on because you closed your eyes for a moment; it is a light he keeps shining, one that we can wander toward or away from, but absolutely need to walk within. Grace is his light overpowering our intentional blindness. This entry was posted in Faith, Language and tagged calvinism, darkness, god, gospel, Jesus, john, light, once saved always saved, salvation, sin. Bookmark the permalink. About your A) and B) above… Until I visited the south, I never heard the idea that one had to pray for forgiveness for forgiveness to actually be granted. I find this idea interesting. Because of this believe, I wrote an article back in 2009 that addresses the same thing you are talking about. I’ll email it to you. Instead of saying you believe in a form of “once saved, always saved,” it’s better to say that you believe a Christian’s eternal security. Yes, I phrase it as my technically believing in “once saved, always saved” in order to find common ground with Calvinists before getting into the free will discussion with them.